• 75% of the regularly occupied spaces are daylit. • 43% of the total material value consists of products manufactured and/or extracted locally. • 68% of the total materials value was comprised of salvaged, refurbished, or reused furnishings. The Smith Eighth Floor Campus Services Center LEED ID&C renovation project is an interior renovation of existing office space located within the Harvard University Housing office suite on the eight floor of the Holyoke Center to accommodate the expanded needs of the Harvard University Campus Services and Transportation Services Department. 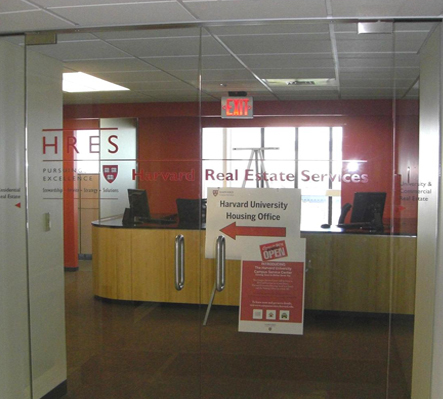 The purpose of the new Campus Services Center is to provide a single location conveniently located within Harvard Square for Harvard students, faculty and staff to visit when looking for University housing, parking permits, and Harvard identification cards. Existing office spaces were removed to create the open floor space required for the new programming which includes eight (8) flexible customer transaction stations to meet peak customer demands. The new Campus Service Center open floor plan allows the project to take advantage of the window wrapped perimeter providing natural daylight to 75% of the space and direct views for more than 80% of the regularly occupied spaces. As a central hub of University activity, the space will feature signage to educate future occupants and visitors about the many sustainable features included in the LEED renovation, including the flexible and multipurpose layout and design that allows for increased transactions during peak operational times.